World Partnerships is the multiplier for essential projects, ideas, and best practices through business, educational, arts, cultural and social engagement. 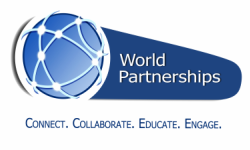 World Partnerships is a unique global network of over 5,000 alumni in 190 countries comprised of young business and political leaders, journalists, pioneering women leaders, community organizers, policy officials, environmental activists and young entrepreneurs, all engaged in changing the World. Our "New Generation" alumni span the Globe! They are entrepreneurs, scientists and educators without borders. They are architects of public/private partnerships. They are foreign trade officials. They are "women of courage." They are alternative energy policy officials and private investors. They are Deans of Business Schools training the next generation of entrepreneurs. They are the new political leaders. They are leading transitions to participatory democracy. They are leaders of civil society. They are the face of corporate social responsibility training. They are empowering the underprivileged through education and training. They are the "New Voices" of journalism and social media worldwide. They are "The Arab Spring." They are fighting trafficking in human beings. They are saving women's lives through breast cancer awareness. They are the global forces of rule of law, the Judiciary and law enforcement. They are the architects of their national governments. These New Generation leaders are all looking for a new way to connect, collaborate, educate and engage across international borders with "the America" they encountered, and with each other. World Partnerships Connects You To The New Generation. Follow these links to discover some of the ways we engage this New Generation! Stay tuned as we develop and roll out new ways to Engage the New Generation!